Ad agencies, Havas Worldwide and Perfect Fools, have teamed up with the Netherlands' Metropole Orchestra, to make the modern idea of the symphony a little more social. The orchestra’s subsidy and existence is currently under threat, according to Perfect Fools, and to raise awareness and save itself, the orchestra is trying this new approach. 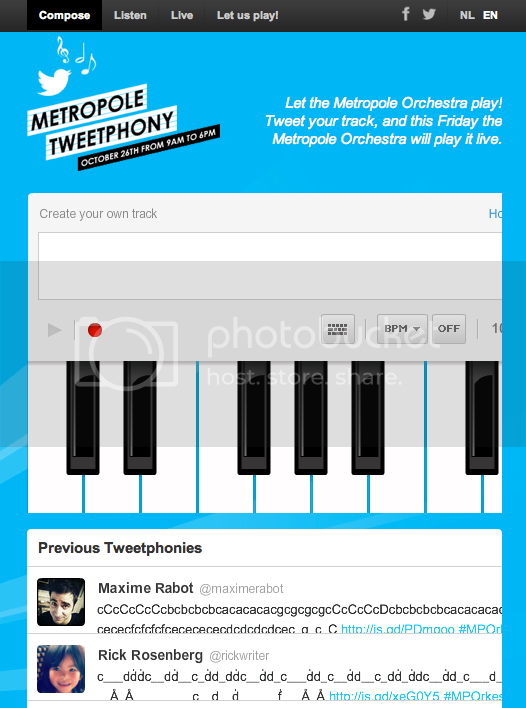 On October 26h, the Metropole will play a symphony crafted entirely by tweets based on music notes matching letters tweeted. As first reported by PSFK, the performance will be compiled from the best and most interesting tweets submitted via the campaign's site, which features a digital piano interface that visitors can use to compose their own tweets. The orchestra will play the selected tweets at the ‘Tweetphony,’ which will be held on October 26th and streamed live on the site.